It’s the last weekend of summer for Annabel! We’re both excited for her to go back to school, while also being sad her break is over. Last week, my mom took her clothes shopping, I bought her some shoes, and she got her back-to-school haircut. 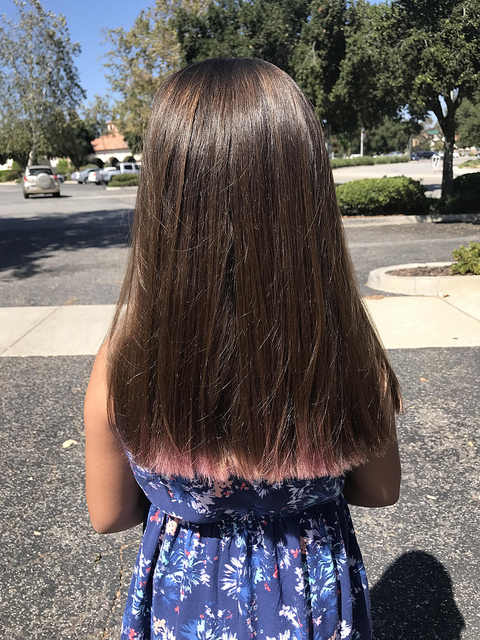 I told the hairdresser to keep the tiniest bit of color on the ends of her hair. It’s mostly faded into a very light pink, and soon it will just be blonde. Annie was sooo excited when she saw there was a bit of color left. What can I say, I’m not a regular mom, I’m a cool mom. Some of these might be difficult, but all of them are incredibly important. I hope you make the time to read them. Scream into your sheet cake while you read, but then get up and do something about it. History has its eyes on you. ~What Brands Are Actually Behind Trader Joe’s Snacks? ~Tampa Bay is due for a major hurricane. It is not prepared. We are so excited by the reception The Toddler Survival Guide is getting! If you follow our Facebook Page you’ve probably seen these, but we have been receiving a lot of positive reviews. Hannah Reads and Hidden Doorways both gave us four-star reviews, and Red Tricycle included us in their roundup of best new parenting books to read right now. I hope you all are liking the book (and if you wanted to leave an Amazon review, that would be fantastic!)! ~My 20th high school reunion is next month, and I’m tempted to get a pair of old school checkered Vans to celebrate. Those shoes remind me of the Gennera Hypercolor shirts that were popular in the late 90s. Very cool. I’m afraid I haven’t bought The Toddler Survival Guide yet (I’m currently a medical student, so toddlers are still a wee while off) but I was very excited to see it on the shelf in my local Paperplus in Dunedin New Zealand! Wow, that’s so cool! Thank you for letting me know!!! I can’t wait to see how your shoes come out!! I just ordered all the material, so I hope it’s as easy as it looked! Just before my daughter turned 12 we allowed her to get red tips. Her hair was light enough that she didn’t need any bleaching before the red was added. This evolved over the next 18 months from tips to more than tips, to tips with a couple streaks, to all over wash out for Halloween, to all over Splat! (RUN AWAY from that nastiness) to having her stylist lighten and fade the all over (it was a pretty rose gold with 3 inches of roots), and now her entire head is a beautiful sunrise of pinks and yellow tips. She’s 13. I don’t color my hair at all and she would be pleased to never ever see her actual color again. LOL! Thank you for posting all these articles, I will read each and every one of them. Oooh, I have to do these shoes with my grandkids! Love it!